A couple of months ago a number of reporters were invited to descend into the massive tunnel being bored between the MacArthur Causeway and the Port of Miami. Andres Viglucci, reporting for The Miami Herald, set the tone for his article like this: “Move aside, Jules Verne, we’re going in.” He writes of Harriet, a massive Tunnel Boring Machine, as a dame, and makes himself and his colleagues come off as hard-to-impress, adventure-hardened Indiana Joneses on “a stroll 700 feet down an easy incline along the floor of a smooth concrete tube.” A quiet stroll, business as usual. 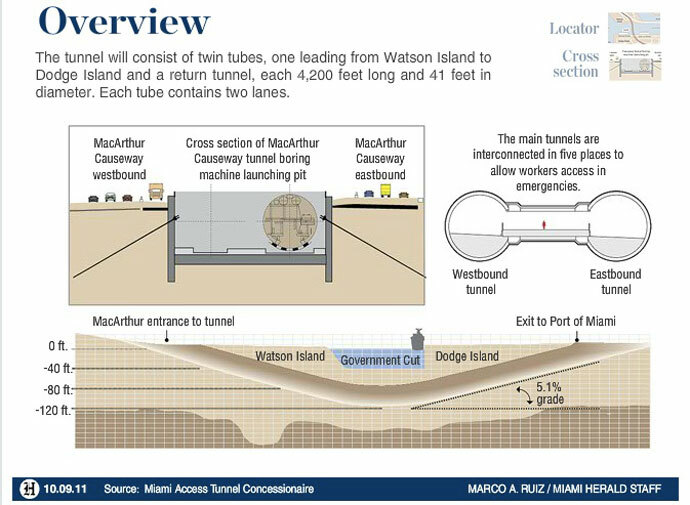 This is why I’m not a journalist: I’d have found it impossible to be sitting in a tunnel 45 feet deep, under a saltwater channel, imagining five massive strata of sedimentary rock behind the concrete walls, and sacrifice unhinged speculation to cool irony. In that situation, inexpertly wired as I am, I’d be thinking of how in Miami transmodular shipping––or containerization––has literally left the surface of the city. It has brought us to where we find it commonplace to dig subsea floor connectors and raise extra highway lanes in the name of efficiency and convenience. Which is just another way of saying that we’ve hit some kind of threshold beyond which we have no qualms about altering the urban landscape in unprecedented ways in order to respond to the demands of transnational capital, to have its flows intensify as they cut through our city at the cost of everything else. When we begin to think of it in these terms the supposedly super savvy language of journalistic irony––of the journalist as unimpressed skeptic––seems to me to falter. What this language begins to reveal in its blasé mode is that it recoils from the magnitude of the things it faces. It settles into its unbendable demands for empirical observation, for facts, for some kind of relationship with common sense. Unfortunately, it is precisely common sense and the possibility of “capturing” what is happening through empirical observation that we have left behind. The news here is not in how taxpayer money is being misspent or some such thing––an exposé assembled by unearthing a few documents, turning out a whistle blower, and connecting the dots. The news here is of an altogether different kind. It’s in how self-guided transnational forces are splitting the city: on one side, we continue to drive to work, go to restaurants, ride our bikes, read the paper; on the other, the movement of resources has been optimized as a way to capture some of that investment capital that floats around unanchored to any dusty and now laughable old configurations like the nation-state. That is, a whole new lattice of axes is being grafted to the city for the sole purpose of moving resources faster in order to generate more profit, to seem competitive and desirable in a global race for the lowest cost. And this is happening in a city whose latest large-scale urban project is Miami 21––a re-zoning plan, developed by the New Urbanists, whose goal is to turn the city into a quaint little town. This foreign lattice of axes becomes easier to discern if we zoom out from the port and look out over other parts of the city. Drive east from the Turnpike on Northwest 25th Street (12 miles west of the water) and eventually the street will split in two––regular car lanes on the right and a ramp exclusively for trucks on the left. It’s as if these trucks were being lifted onto a plane that has been “de-laminated” from the surface of the city. Its sole goal is the unimpeded movement of cargo. We see here again, as in the port tunnel, the city divided into two planes. They may be connected at certain points, but their use couldn’t be more incompatible. On one, as I was saying above, we live. It’s synchronized to our schedules. Rush hour, Heat games, school speed zones, etc. On the other, nothing but the movement of goods, which means an extension of global transmodal circulation lines. It has no schedule, no stoplights, no shifts. It is open round-the-clock; it participates in the effort to turn the entire surface of the planet into a synchronized, always-open-for-business space. Eventually, one level of the city will swallow the other through the institution of privatized infrastructures, the recalibrating of the city’s financial sector, and investments in the ascendancy of politicians with the “proper” interests and vision. Irony in the face of this amazing reconfiguration of the city––which, by the way, may be leaving the idea of the city itself behind––seems the work of myopia or terror at the monstrous magnitude of what is at stake. That is, the work of the journalist crafted for a different kind of city or the erection of psychic barrier walls to fend off the unassimilable shock of a planet reorganizing itself, like some soft cephalopod, to respond to the demands of an economic system allergic to equilibria and loss––a system whose imaginary is based on eternal growth. Instead of hardboiled fact gathering, this calls for rampant speculation. And this speculative opening seems to demand a language that functions on a different register than that of the respectable reporter’s. I suppose for some this means a serious language of projective analysis and for others one of fiery political rhetoric. For me, claiming the benefits of the unregulated non-professional and not averse to going way lower than Jules Verne on the Philistine’s literary totem pole, it’d be something closer to the language of H. P. Lovecraft––a discourse of the monstrous, in all its pulp glory, sustained by a bedrock of rigorous materialism. I’d begin by speaking of the Anthropocene and the Chthonic. The former, among geologists and other scholars, is the name that is increasingly being accepted for our Age––an age in which humans unleashed their Earth-shaping powers and altered the planet irrevocably. A period which ends––in a politicized conclusion synthesized out of what the scientists have said, but who knows if endorsed by any of them––with the subsuming of these Earth-shaping powers by the drive to grow and accumulate capital at a global scale, increasingly moving toward an automated production and trade that is slowly and ironically displacing the bio-mass that powered the transformations that characterize the Age in the first place. And then, there is the Chthonic––a distribution of power that reminds us, puny humans, of our unimpressive and transient slot in the universal scheme of things. The Chthonic is something like an altered and assailed Earth given agency and allowed to unleash its own powers of retaliation. It seems to me this sets the stage for an epic battle between two massive forces: the drive toward eternal capital accumulation, unleashed through a system of containerization (and other things, like disembodied financial markets) that has re-carved the planet into a series of networks and interfaces in a measly 50 years, and the resistance of the Chthonic through things like increasingly unpredictable weather systems, surprise volcanic eruptions that paralyze entire continents, and melting polar caps that will soon put a number of port cities under water. Recasting the tunnel project––and the grafting to the city of a lattice of axes employed exclusively to move resources and goods––into a fantastic scenario of engaged global forces endowed with non-human agency may offend the no nonsense empiricism of reporters––not to mention that it would certainly elicit a searing dagger of a stare from any of their editors––but it brings us closer to shedding light on what is at stake in this city: a wager to completely reconfigure it into an important node in a global transportation network. It’s a quiet but epic struggle for identity––or, better yet, for that amorphous, unstable, slippery Thing that lurks just beneath a city’s identity markers. It’s a struggle that has happened elsewhere––even if in ways that responded to different historical circumstances. In Newark in the late 1960s, for instance. Global containerization was at the heart of it in that case, as it is in this one. But what is unique in our case is that the front-line forces on the ground have changed. Resistance these days, if it comes at all, will no longer come from labor. It will come, instead, from a strange collection of interested parties, which will include environmentalists and civic groups as much as the tourist and culture industries. A weak first line of defense by any measure. But of course there will be the obstacles that the landscape itself generates, the Chthonic’s black ops––endangered coral species, raised sea levels, Harriet-busting limestone, high-octane hurricanes eager to topple the alien arachnoid cranes that tattoo themselves on the horizon every morning, and the ferocious storm surge that follows in their wake determine to burst the massive floodgates that are supposed to seal the Port of Miami tunnel when the weather threatens inclemency. « Raise High The White Flag, Mancini: In Which Manchester City’s Coach Concedes. Again.